The San Diego Union-Tribune's David Carrick reports on a grand jury finding that San Diego is not properly managing its corporate marketing partnerships and whether they are succeeding for the city. Of note in the story is a deal made in connection to the 2021 U.S. Open at Torrey Pines. Turfstar is providing San Diego $7.5 million in cash and other contributions over 12 years, in exchange for the city agreeing to exclusively lease all mowers and other golf maintenance equipment from Turfstar. Now, maybe this $7.5 million will help the maintenance crew move those leased mowers out of the 2008 U.S. Open tent and under a real roof, and maybe Turfstar is just breaking even on the deal, but that is one big loan for mowers. Farmers: A Golf Tournament With Not A Single Grandstand! 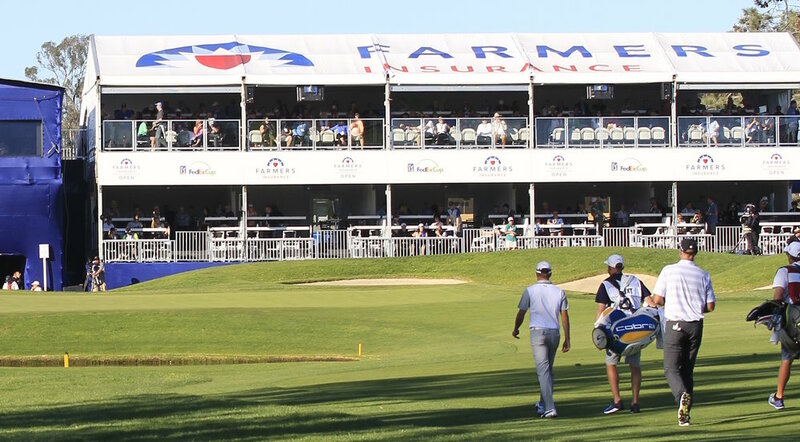 As was noted earlier in the week, the Farmers Insurance Open has made strides since nearly becoming extinct. But the operation, at least for the average paying customer, leaves much to be desired. 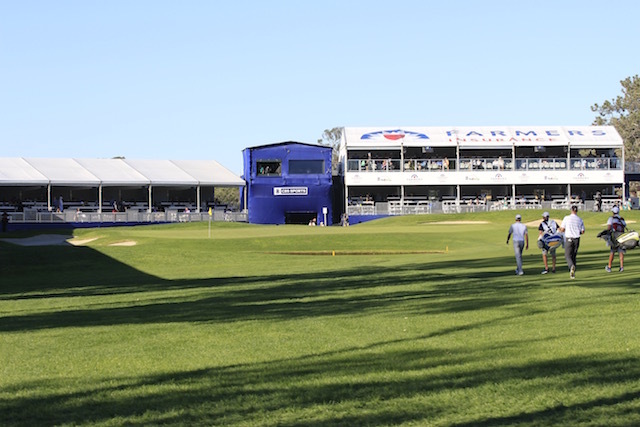 With a daily ticket price of $50 ($35 for senior), the event does not offer a single grandstand for general admission fans to sit on a green and watching play. Even worse, there is only a small 50-yard long area right of the 18th green for standing to watch action, leaving play to conclude, at a public golf facility, to finish in front of only corporate customers. This might be moot if Torrey Pines had stadium mounding or even a green complex or two that were not raised surfaces. They do not and with all of the closing holes off limits to fans, this leaves surprisingly few places to comfortably watch action. At the $50 general admission ticket price, the Farmers could be the worst tournament experience in golf. Growing the game, it will not. The event obviously needs to generate revenue to pay off debts and surrounding holes 14 through 18 with corporate tents helps sell premium tickets and expensive packages. But at a public facility that the people of San Diego sacrifice for a few weeks, the anti-grandstand gesture seems in poor taste. And given the game's need to add new fans and keep old ones coming around, is it too much to give people a place to sit down once in a while? The 16th green is off general admission limits to fans as well. Tom Weiskopf was on hand to christen his remodel of Torrey Pines North and while it sounds positive in its sensitivity toward the everyday golfer's needs, nearly every photo shows very distinct step-tiers in the greens. Which, I realized after seeing them in images, has become such an increasingly rare look. Toward that end, Weiskopf has reduced the number of bunkers from 60 to 42 and made them generally easier from which to play. Average green sizes have increased from about 4,500 square feet to 6,000 square feet. He’s added his signature touch, a drivable par 4, the new seventh hole. The fairways are marginally wider and he’s softened playability in areas fronting the greens. Kirk Kenney noted Weiskopf's devotion to the project in a San Diego Union-Tribune story that also seems to be accompanied by John Gibbins' photo gallery (I couldn't get more than one image, maybe you'll have better luck). Weiskopf, 74, and his wife Laurie moved to Del Mar during the 5 1/2 months of the redesign so that he could stay on top of the project. He observed golfers on the course during the month before construction began to gain insight that improved initial ideas. He listened to concerns of golf members at meetings. And he shared with them his ideas. One of the major changes was swapping the front nine, featuring the course’s most scenic ocean-side holes, with the back nine. The idea received unanimous support by the time Weiskopf had explained his reasoning. “I just think this is your brand,” he said. “The ocean, that beach, these ravines, the distant view that we catch down to La Jolla. San Diego, the pier and the surf breaking." As the 2016 season progresses, Brandt Snedeker's final round 69 at Torrey Pines may be the barometer for great rounds going forward, particularly given how well he scored in brutal conditions. Walker bogeyed four of his final eight holes to drop out and K.J. Choi missed a long birdie effort at 18 to tie. The final-round scoring average was 77.9, nearly eight strokes worse than Snedeker’s score. Twenty-three of 71 players failed to break 80. The highlights lack shots from the winner or of a crowd. Strange day indeed. Hearing what Phil Mickelson had to say about the Torrey North project and still struggling with the $12.6 million budget, the ethusiasm is mild at best for the upcoming renovation of this property. On site here the phrase "missed opportunity" has been thrown about a lot (and it's only Wednesday). Though I think Mickelson mistakenly kept his plans pretty private, the more I hear about them, the more I fear Torrey Pines missed an opportunity to improve. "I don't understand the politics of it at all," Mickelson said of the impending redesign of Torrey Pines North, which Mickelson had hoped to direct but which instead will be overseen by Tom Weiskopf. "It makes no sense. I think it's terrible business practices, but it's what we live with here." Mickelson was one of the first designers to consult with the City of San Diego about Torrey North, perched on the cliffs above the Pacific Ocean, and had said he would even waive his design fee. But because he was part of the preliminary talks, the California Fair Political Practices Commission forbid Mickelson's design group from submitting a formal bid. "I'm not bitter about it," Mickelson said. "I just kind of learned to accept that as being one of the sacrifices of living in California. It is a personal place, it is a personal thing for me because of the memories, the history, the nostalgia that I feel every time I walk on the grounds here. The San Diego Union-Tribune's Tod Leonard endorses Tom Weiskopf's vision for the Torrey Pines North Course, though I'm not clear how much of it is based on getting to see actual plans/conceptual drawings, and how much is based on just how much less-awful Weiskopf's plan was compared to the alternatives. Furthermore, after seeing this year what Weiskopf did in giving TPC Scottsdale sand-flashed bunker faces that looked dreadful compared to the previous version of the course's time-tested moonscape-vibe, it's hard to gauge how sensitive he is to what has proven to work over time. Weiskopf’s plan on paper is detailed and direct. It removes the least amount of grass (5 acres), and so there is little fear that the essence of the North Course will be lost. There isn’t any danger of this spinning out of control with waste areas and becoming a desert course on the cliffs. There are some creative additions by Weiskopf (such as making 16 a driveable par-4), but nothing outlandish. Who doesn’t vote for shorter holes? 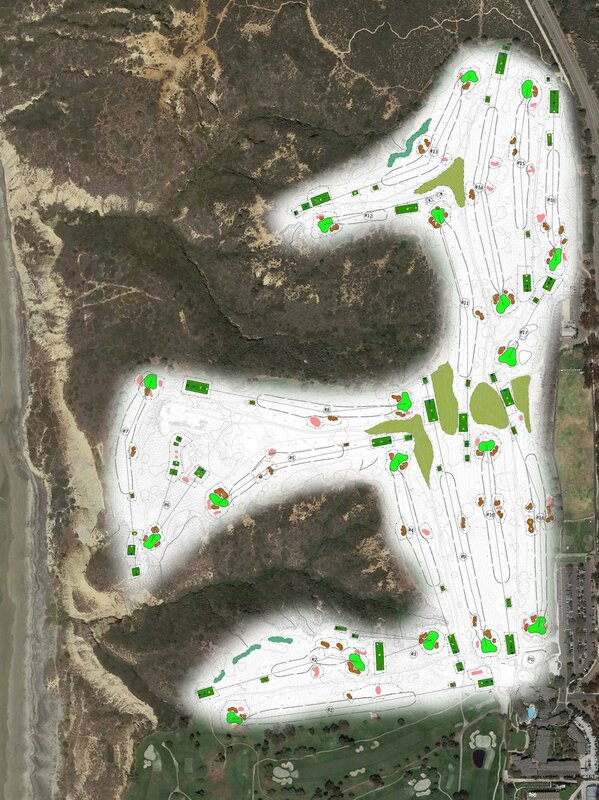 There will be fewer bunkers on the North Course than there are now, so that should allay concerns that this is going to become another South Course. As for the greens, let’s face it, for their age they are maintained at a fabulous condition by the greenskeepers, but they have their issues, especially when they are cut low and speeds are fast. As the course readies for the Farmers Insurance Open, downhill putts on the North that are merely tapped race 8 to 10 feet past the hole. Tom Weiskopf spoke to the San Diego Union Tribune's Tod Leonard about winning the combined architect/contractor bid to renovate the North Course at Torrey Pines. The story includes some encouraging remarks from Weiskopf offset by discouraging news that drawings still haven't been seen and greens are going to be redesigned. The North currently has a nice set of greens needing only relatively minor massaging for speeds and sand build up, so any attempts to reimagine their contouring comes with risks. That'll be interesting. Especially since all three now have very different bunker styles. New bids were solicited, and the architects and construction companies that applied were Weiskopf/Wadsworth, Robert Trent Jones Jr./Frontier, Cary Bickler/Landscapes Unlimited, and LPGA Tour player Natalie Gulbis/Heritage Links. Jones emerged with the highest scores from a city golf committee, but it was then discovered that his company’s bid included work for about $2 million over the established budget. That automatically eliminated Jones from the opportunity, said Kevin Oliver, project officer from the city’s public works department. After Phil Mickelson was ruled ineligible by a pending ruling related to governmental rules, the job to remodel Torrey Pines North was opened to contractors who then brought in an architect to join their bid. Meanwhile it was all done in a secret process, though Tod Leonard had reported some (Tom Weiskopf, Robert Trent Jones) but not all of the names of architects who were attached to the contractors (Natalie Gulbis!). The entire thing has been done in secret, which is probably best in a time of drought since the entire process makes one yearn for a long shower. Now Joe Passov reports for golf.com that Tom Weiskopf will be overseeing the renovation of the affordable daily fee North. The renovation budget for Weiskopf's team is roughly $12.6 million. They will rebuild all 18 greens and rework the greenside bunkers. All the tees will be leveled, with some enlarged and others combined. Other planned enhancements include a new set of forward tees, several new back tees for tournament use and reshaped and relocated fairway bunkers. Approximately five acres of existing turf will be removed and replaced with a drought-tolerant landscape pallet. The renovation will also include new cart paths and a new irrigation system to help maximize water efficiency. There will be no major alterations to the par or routing, but Weiskopf may look to find a worthy candidate to transform into a drivable par-4, one of the designer's trademarks. Well he's got a little over a month to figure it out. 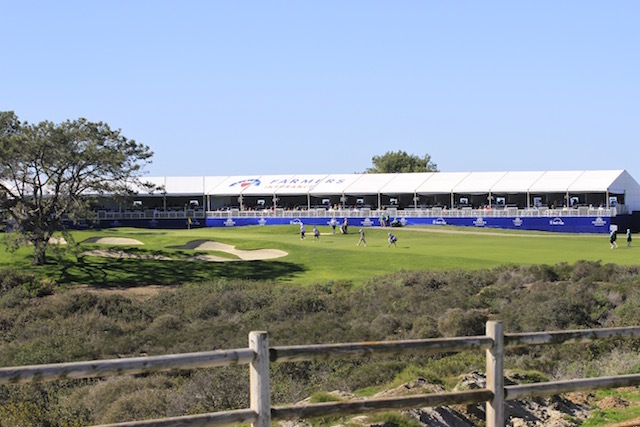 Construction is slated to begin after the Farmers Insurance Open at Torrey Pines South. Torrey North: "The reality has become something of a nightmare." "Concerns About Torrey Pines North"
Going to a public course means getting to learn some of the financials associated with hosting the U.S. Open.